I’ve lived in my house for five full years now and have never once purged my spice cupboard in all that time. I even have some items in there that I distinctly recall packing up and schlepping all the way across town from my old house. I am cooking a lot more lately, and have made a few purchases of spices that I already had but didn’t remember that I had and could not find. I’d just as soon nip that habit in the bud. Here’s what I started with. Not a disaster, but overcrowded and disorganized nonetheless. I had bottles of dry spices intermingled with bottles of liquids (oils, vinegars, etc. 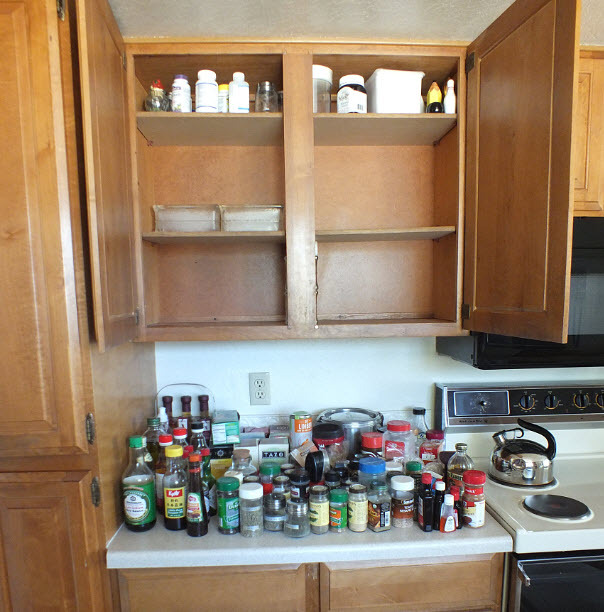 ), and baking spices were sort of grouped together but some had gotten mixed up with the cooking spices. I found several opened packets of various seasonings, rolled up and secured with a rubber band—like I’m ever going to pull those out and use them. Ha. And I had way too many boxes of tea, which is funny because I don’t even drink tea anymore. First rule of organizing: Get rid of everything you don’t know to be useful or believe to be beautiful. Oh yes, and get rid of all the crap, too, for heaven’s sake. I threw away a lot of outdated stuff (I label spice bottles with the month and year of purchase and throw them out after three years or when the product loses its aroma and/or color), plus several baggies of bulk spices that had no labels and were no longer identifiable (memory being the fragile flake that it is at my age). I found only a couple of redundancies, fortunately: two bottles each of allspice, cornstarch, paprika, and (of course) pumpkin pie spice. Who actually uses up an entire bottle of pumpkin pie spice before the holiday baking season rolls around again, anyway? Second rule of organizing: Make a place for everything and clean it before you put things back in that place. Third rule of organizing: Group like things together. 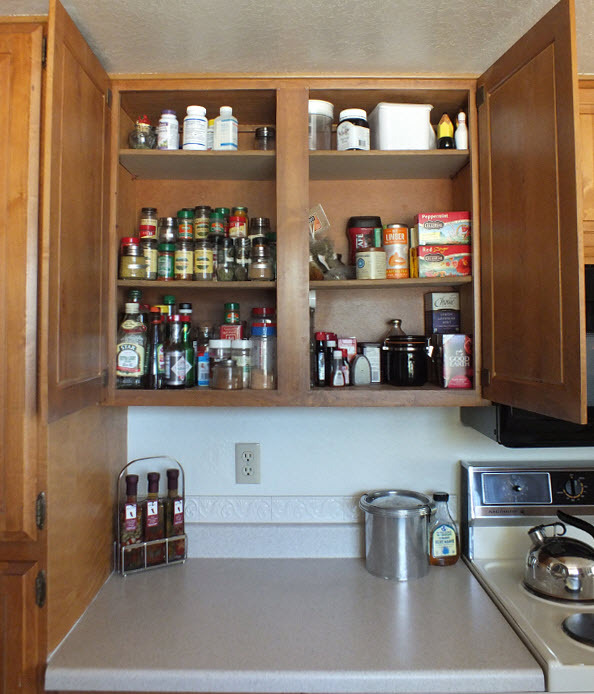 I put the cooking spices (mostly) all together and in alphabetical order on the middle left shelf, coffee and tea on the middle and lower right shelves, baking spices on the lower right shelf, and the liquids on the lower left along with a few taller bottles of dry spices. And, we’re done. Now I can find everything! No system is perfect, of course, but the important thing is to have some kind of system that allows you to find what you have when you need it. Otherwise you waste time, gas and money on trips to the store to get things that were sitting around somewhere in your house all along. Such as, yet another bottle of pumpkin pie spice or cornstarch. I am the child of a father whose mantra is “Use it up, wear it out, make it do, do without” and a mother whose mantra is “See it, like it, buy it,” so I have, shall we say, sometimes contradictory attitudes about money. But as I get older, I am kind of edging more toward being frugal, or at least not foolishly wasting money by failing to pay attention. 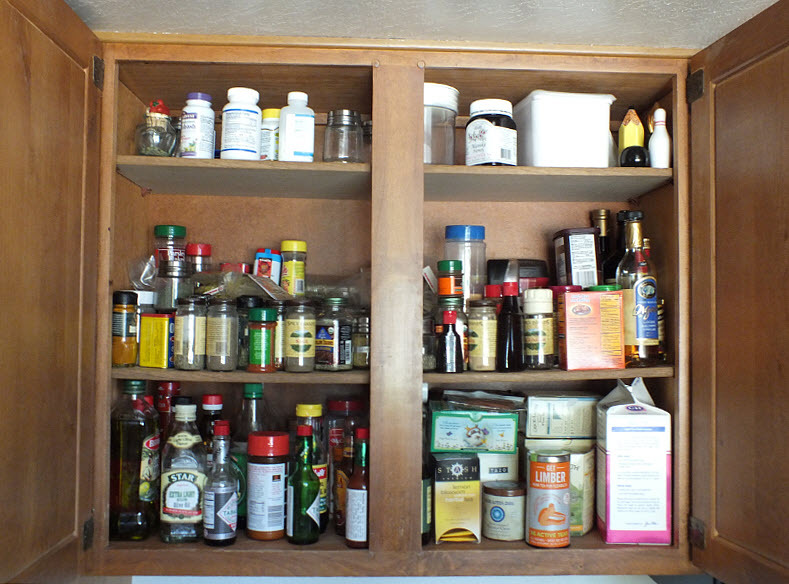 So the time it took me (about an hour) to organize my spice cabinet today was, I think, a smart investment. I read today in the LA Times that the price of a one-day ticket to Disneyland has increased from $87 to $92. Holy cow, and I thought 3D movies were expensive at nearly $15 a pop. The summer after I turned 12, my parents moved us from one town to another so that my dad could take a two-year sabbatical from his college teaching job to complete his Ph.D. While my parents were busy moving house, my grandmother took my brother, my sister and me to Disneyland. I think we went for only one day, although it might have been two. Possibly my aunt and uncle were with us (this was more than 30 years ago; details fade). So let’s assume our party included three adults, two children over 10, and one child under 10. In 1978, that set my grandma back $40 (equal to about $140 in 2012) for each day’s tickets. That same party today would pay $546, which in 1978 would have been nearly $2,000. 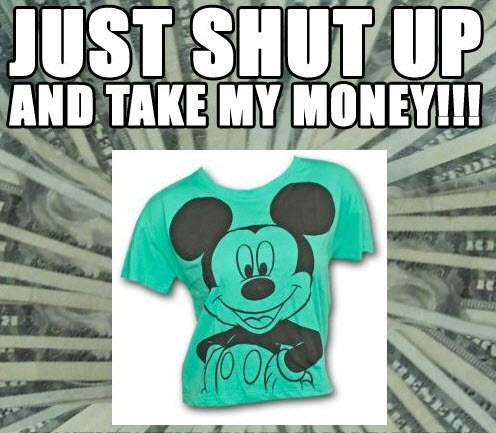 I have been back to Disneyland only once since then, and I don’t remember exactly when I went or how much I paid as an adult, but the price didn’t sear itself in my mind so it couldn’t have been that much. Maybe it was $25 or $30. Even if I had a hankering to return to the Magic Kingdom again someday, which fortunately I don’t, the price of admission alone would sour me on the idea just on principle. It might be the happiest place on earth, but if it costs a grand to take the family for a couple of days, well, I can stand to be a little less happy somewhere else. I like to play the lottery from time to time, as we know, so this evening I picked up a Mega Millions ticket for the “Apocalypse Day” drawing on Friday. The jackpot’s only $12 million, hardly worth crossing the street to buy a ticket for, but what the heck? This could be the week. As I was waiting for the machine to print my ticket, an older gentleman at the counter next to me finished scratching off his tickets and tossed them away in disgust. “Nah, not tonight,” he said. I remarked that he must win something once in a while because he keeps playing. “I won $10,000 once,” he said, “but the government took $3,000 of it.” He was clearly still bitter about this. “Well,” I said, touching his arm lightly, “you still came out $7,000 ahead, which was money you wouldn’t have had otherwise.” I took my ticket and left him standing there looking slightly puzzled. I’m not sure why, when some people receive a windfall, the first thing they think is, “why didn’t I get more?” If I’d ever won $10,000 and ended up with $7,000, I’d still be talking about how fortunate I am and what a blessing that was, that one time, when I won all that money. But that man has probably forgotten already what he spent the money on. He’s not forgotten what “the government took” from him. His primary association with winning the lottery is bitterness over having to pay taxes on his winnings. What did he expect, sympathy? Because he got lucky and won some money, but it wasn’t quite as much money as he thought it would be? Really? Sorry, I can’t get next to that one. Income is taxed in this country and that’s just the way it is. No point in crying about it because it isn’t going to change. Better to bless whatever income you have and make the most of it. When money falls out of the sky into your hands, be grateful! Speaking of which, I enjoyed a windfall of sorts this morning. I took my car back to the dealership to see about those shocks, and insisted that the service manager come out and inspect my car to determine whether this was actually needed or if the car’s misalignment might have caused the wear pattern on the rear tires. (See yesterday’s post for all the details.) He did inspect it, determined that the shocks were fine, and sent me on my way without trying to sell me one single thing more. So that was $300 I didn’t have to spend on my car today, some most all of which I used instead to buy Christmas presents for my family. I am very pleased about the gifts I found for them. This sweet video captures perfectly how I feel about Christmas … every year.